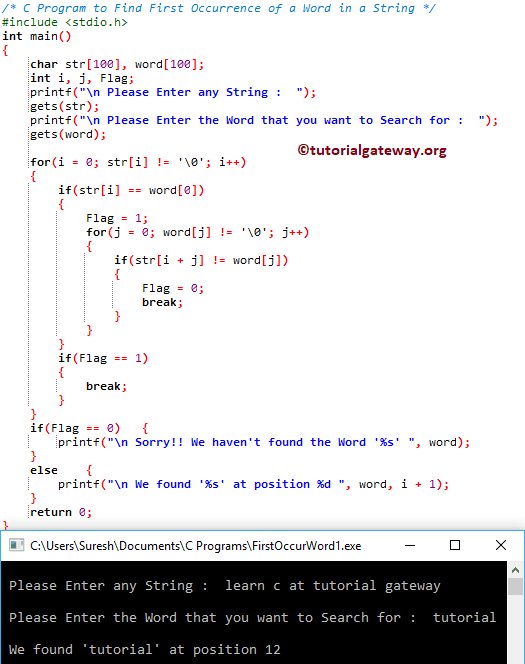 In this article, we will show you, How to write a C Program to Find First Occurrence of a Word in a String with example. For this, we are going to use For Loop and While Loop. This program allows the user to enter any string, or or character array and stored it in the str variable. Next, it will ask the user to enter any word to search. Next, compiler will search the entire string, and find the first occurrence of a word. Next, compiler will enter into second For loop. Here, Second For loop is to check whether each and every character in a given word is equal to a word in str or not. Do the same for the remaining iterations until you complete the comparison of str[i + j] vs word[j]. As you know, the condition if(str[i + j] != word[j]) will always return false. If any single character is not matching then if(str[i + j] != word[j]) will become true, and Flag will become 0. Once the j value become 8, the condition inside the second for loop will fail. if(Flag == 0) – Condition is False. So, compiler will print the statement inside the Else block. Remember, i value is the index position and i + 1 means actual position.